Unlike that of the first Falcon Heavy, this rocket’s pre-launch schedule has been much smoother despite some small slips to the right on the schedule. While the first rocket had several Wet Dress Rehearsals (WDRs) – involving fueling the tanks and readying the rocket, but not igniting the engines – this rocket has only its since-conducted static fire planned. 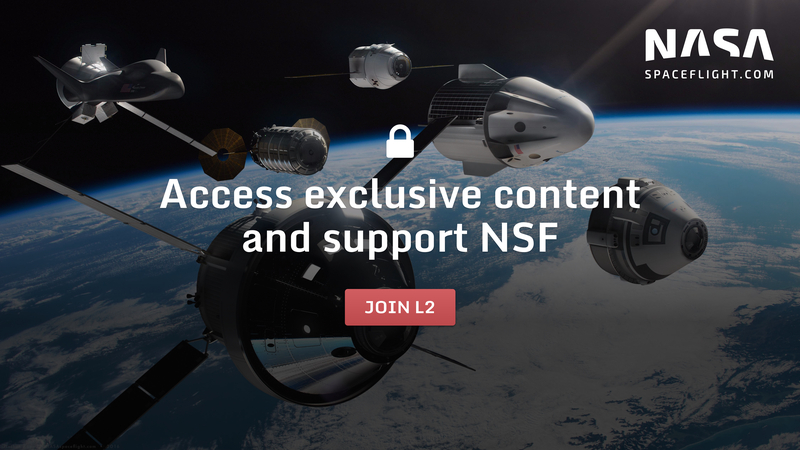 (NSF Videos Live Stream timestamped to the event, hosted by Chris Gebhardt (@chrisG_NSF) With thanks to Das at KerbalSpaceAcademy and LiveU for their help and assistance). The static fire test is essentially a WDR – with a quick test burn of the 27 Merlin 1D first stage engines added on to the end. Along with the Falcon Heavy, the Falcon 9 also performs its own static fire. 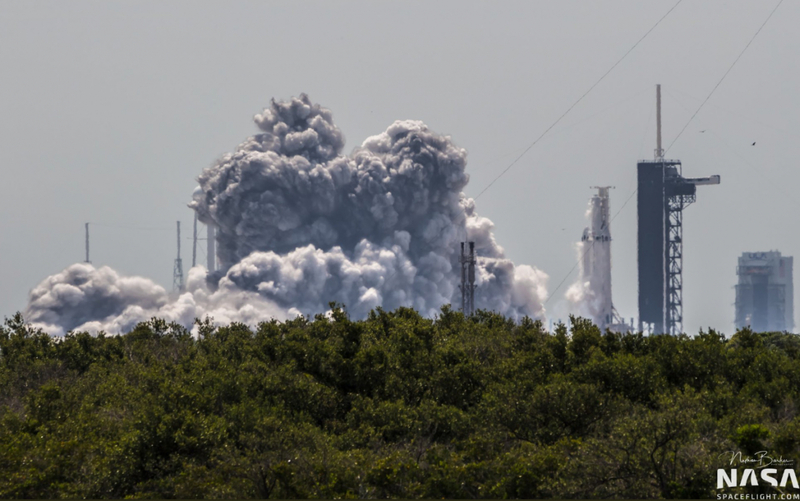 For the Falcon Heavy Demo mission, the rocket performed a 12-second static fire – over three times the regular duration of Falcon 9’s. 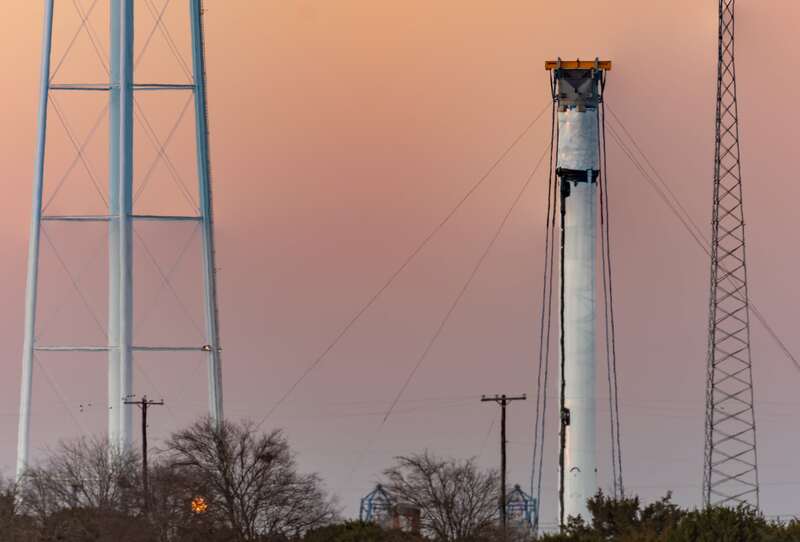 For this mission, it is unknown how long the burn will be, although visually it appeared to be slightly shorter than the first FH Static Fire. The Falcon Heavy Demo rocket performing its 12-second static fire at LC-39A on January 24, 2018. Another difference between the two rockets is their engine startup sequence. For the Falcon 9, all 9 Merlin engines ignite at once. Igniting all 27 Merlin engines at one time on Falcon Heavy would create extreme loads on the rocket and launch mount, so the ignitions are staggered. Only two engines are ignited at one time, each pair a fraction of a second apart, until all 27 engines are firing. This specific rocket is made up of three new Block 5 boosters, and a Block 5 second stage. The two side boosters are B1052 and B1053, while the center core is B1055. 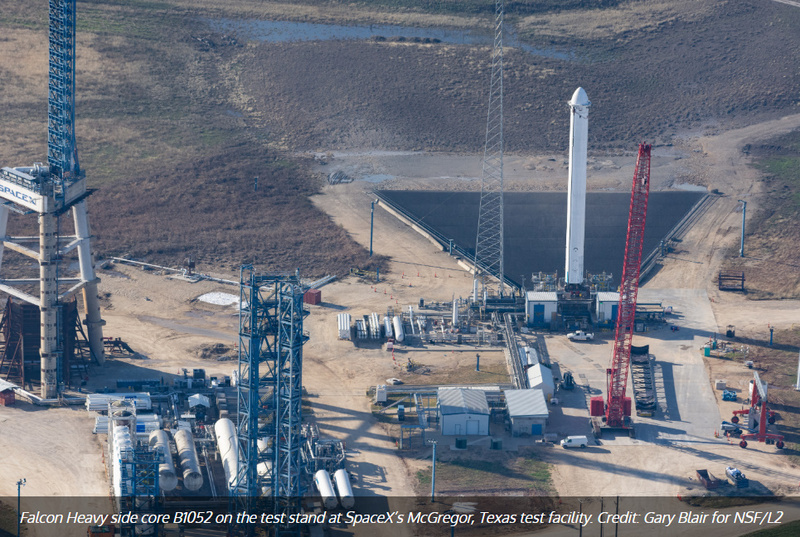 Similar to the Falcon Heavy Demo mission, the two side cores will perform Return-To-Launch-Site (RTLS) landings at SpaceX’s Landing Zones 1 and 2 at Cape Canaveral Air Force Station. The center core – since it is moving much faster at its separation – will land 967km downrange on SpaceX’s Autonomous Spaceport Drone Ship Of Course I Still Love You. On the Demo mission, the two side boosters landed successfully, however the center core crashed into the ocean nearby Of Course I Still Love You. The impact on the ocean sprayed debris at the drone ship, damaging two of its engines and littering shrapnel on the deck. It is important to remember that the Falcon Heavy center core is a drastically different design than the side boosters – which are just plain Falcon 9 first stages. The center core features thicker tank walls, a stronger octaweb, and a modified interstage – all required to attach and support the side boosters. The three boosters for this mission individually completed testing at SpaceX’s McGregor, Texas facility from November 2018 to January 2019. 1052 was spotted on November 17 on the first stage test stand. 1053 was never seen directly, but 1055 was seen on the stand – sporting a white interstage – on January 6. By February 2019, it was confirmed that all three first stage cores for the Arabsat-6A flight were in the LC-39A Horizontal Integration Facility (HIF). Two of the Falcon Heavy cores were spotted in promo videos for the Crew Dragon Demo Mission 1 (DM-1) launch. After DM-1 launched, SpaceX’s pad technicians began the task of converting the Transporter Erector (TE) at 39A to support Falcon Heavy. This involved removing the extra hold-downs that are needed to support Falcon 9, and installing the fueling lines for the Falcon Heavy side cores. After this was completed, the TE was rolled back into the HIF to have the Falcon Heavy mounted on the launch mounts. Arabsat 6A is a communications satellite built by Lockheed Martin for their customer Arabsat. It is based off the A2100 satellite bus, and will provide telephone, internet, and television coverage to parts of the Middle East, Africa, and Europe. Arabsat 6A weighs approximately 6,000 kilograms and will be launched into a Geostationary Transfer Orbit. After it separates from the Falcon Heavy second stage, it will begin to raise its perigee – the lowest point of its orbit – to a normal geostationary orbit altitude. Arabsat 6A features a hypergolic main engine for major maneuvers. Since this engine is fairly powerful compared to the weaker, but more efficient ion engines on other satellites, it should only take a few weeks – if that – to reach a geostationary orbit. It also features smaller hydrazine thrusters and ion thrusters to maintain its orbit and keep it correctly oriented. Following the Arabsat 6A launch, SpaceX’s next mission will be CRS-17, a cargo resupply flight on the Falcon 9 to the International Space Station (ISS). This is currently scheduled for April 25, and will likely launch from SLC-40, SpaceX’s other Falcon 9-capable pad at Cape Canaveral. The first SpaceX Starlink internet constellation flight – also on the Falcon 9 – will follow in early May, although that date is not set in stone. The next mission for Falcon Heavy will be the Air Force’s Space Test Program 2 – or STP-2 – flight, with 25 small satellites launching at once. 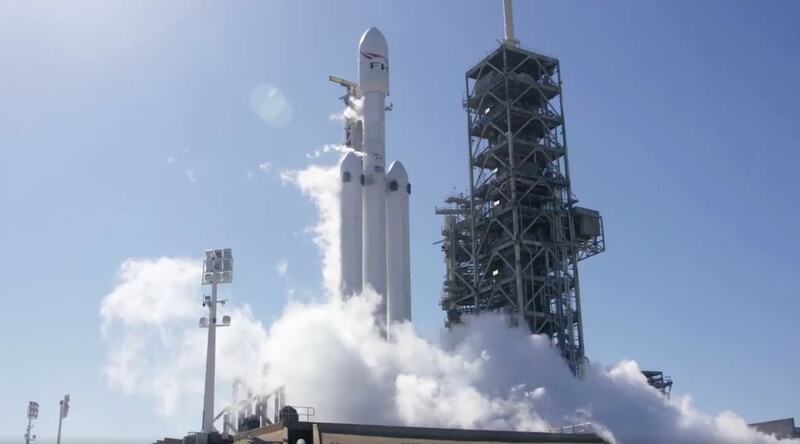 This flight will also demonstrate the Falcon Heavy second stage’s ability to deploy multiple payloads to different orbits, and will feature multiple engine restarts.